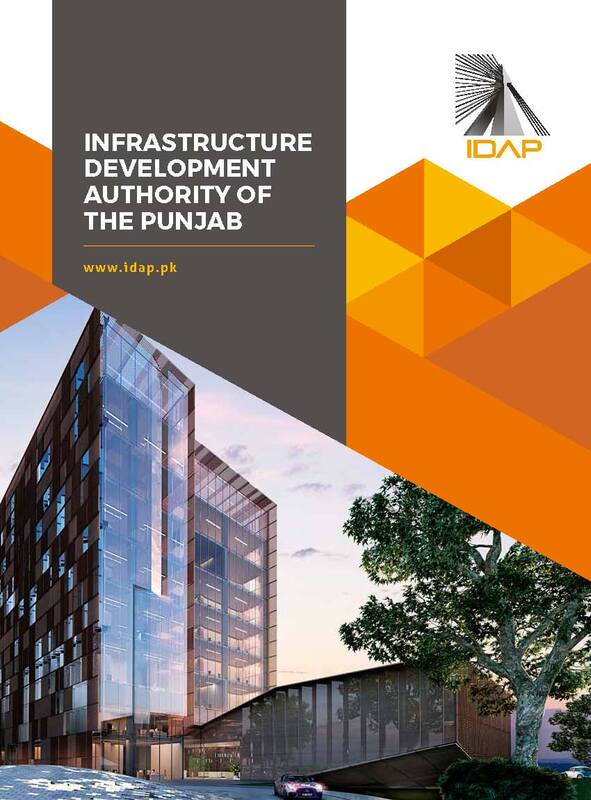 Infrastructure Development Authority of the Punjab (IDAP) is an autonomous body established under the Infrastructure Development Authority of the Punjab Act 2016, for planning, designing, construction and maintenance of infrastructure in the province, in line with the best international practices, to cope with the futuristic development needs. IDAP is a specialized organization free of encumbrances prevalent in public sector departments. The purpose of IDAP is to get mega infrastructure projects executed efficiently, aesthetically, and transparently without compromising quality or entailing delays. In-house complete project management services including feasibility, design, contract management, execution, supervision, third party evaluation, and delivery to the client department. IDAP offers a variety of services to various departments in areas including buildings (multi-purpose for client departments), highways (roads, bridges, flyovers), public transport (mass transit solutions), water resources (irrigation infrastructure), public health (water supply, sewerage, water treatment plants, solid waste), housing (multi-purpose housing, low-income housing) and energy infrastructure (thermal, hydel, solar, biomass, wind). Our vision is to be one of the leading infrastructure design & build organizations in the world. Our mission is to transform Punjab Government’s dream into reality by delivering state-of-the-art projects that fulfil public needs and improve quality of life. Our team is our biggest asset. We work as a family and believe in mutual respect at all levels. We provide an enabling work culture where top quality professionals are empowered to achieve their maximum potential. As a team, we are focused on delivering infrastructure projects in the most efficient and cost-effective manner. Our local and international partners, consultants and contractors are key to our success. We work with them ethically, fairly and transparently. We do everything we can to support and facilitate their work in Pakistan. The Infrastructure Development Authority of Punjab Bill 2015, after being passed by the Provincial Assembly of Punjab on February 03, 2016, and assented to by the Governor of Punjab on February 05, 2016, was passed as the Infrastructure Development Authority of Punjab Act 2016. We are uncompromising in our integrity, honesty, and fairness. We are relentless in keeping people safe and providing a healthy work environment. We are passionate about excellence and doing our work right the first time. Our reputation depends on our delivered value in the eyes of every client and community. We inspire each other with purposeful work, challenging development opportunities, and rewarding careers. We aspire to be the employer of choice in our industry. We actively build a diverse, inclusive, and collaborative work environment where all views are welcomed, openness is encouraged, and teamwork and merit are cornerstones. We are proud of what we do and how we do it. We build positive, long-term, working relationships with our clients, joint-venture partners, subcontractors, suppliers and colleagues that are built on trust, respect and collaboration. We develop and apply world-class technology. We listen, learn, and seek out the best ideas to continually improve. We improve the quality of life in communities where we work by respecting local cultures, engaging local people and protecting the environment. We have a "do-whatever-it-takes" attitude, empowered and entrepreneurial operations within a common framework of values, strategies and key processes.